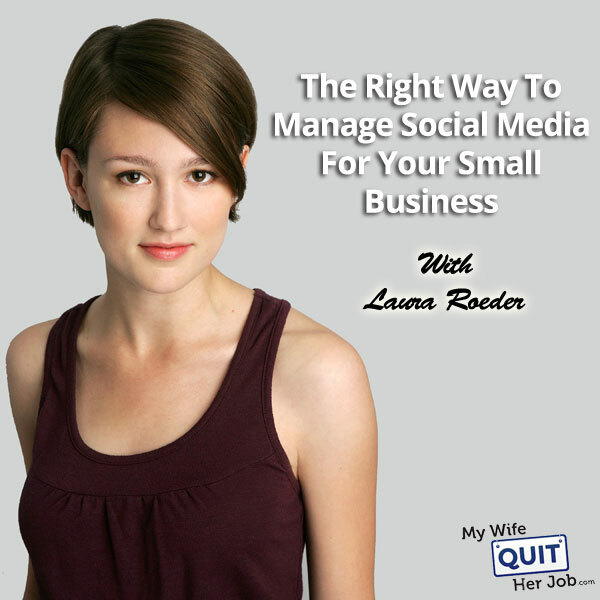 I’ve known Laura Roeder for quite some time and when it comes to social media marketing, she is my go to gal. In today’s podcast, Laura will teach you the proper way to run social media for your company and how she turned her virtual company into a social media powerhouse that makes over 7 figures per year. Laura runs LKR Social Media where she sells various courses on how to become “business” famous. Check it out! How she turned things around to have customers come to her. How she started out at ground zero and what she did to gain traction early on with her business. How to establish your social media accounts from ground zero. You are listening to the mywifequitherjob podcast episode number nine. Now before we begin I just wanted you to know that my podcast giveaway is ending this week, so make sure you sign up soon. Now I’m giving away a free life time membership to my ‘Create a Profitable Online Store’ course as well as free consulting. Now, my course is the most comprehensive course out there that teaches you how to make money within online store. And unlike other courses that are out there, I give live lectures, and I’m constantly adding new content to the course. For more information about the giveaway go to www.mywifequitherjob.com/podcast-launch, that’s mywifequitherjob.com/podcast-launch and while you are there be sure to sign up for my newsletter where I’ll teach you how I managed to make over 100 k in a single year with my own online store. Now, on to the show. Welcome to the mywifequitherjob podcast. We will teach you how to create a business that suites your lifestyle so you can spend more time with your family and focus on doing the things that you love. Here is your host Steve Chou. Steve: Welcome to mywifequitherjob podcast. Today I am really happy to have Laura Roeder on the show. If you don’t know who Laura Roeder is, well you should. She runs ‘LKR Social Media’, where she creates training courses for small businesses that want to learn how to leverage social media and online marketing. So here’s what’s cool about Laura; she runs a virtual team, consisting of members that live all across the world and she has a really interesting story. She started out working in an Ad agency, got really fed up, and decided to start her own business where she absolutely struggled. Now she started out as a web designer, having to scrap her way to get clients, she got fed up again, and decided to change her business model, and instead have the customers fight to come to her. O today her business earns 7 figures, is very flexible, scalable, and the best part is, she can work wherever she wants. And in fact she is so cool that she even got her husband to take on her last name instead of the other way around. I have no idea how she pulled that off. Anyways, I’ve known Laura for quite a while now, and it’s awesome for me to finally be able to interview her online. Welcome to the show Laura. Laura: Thank you, thank you very much, that was a great intro except, he didn’t really change his name. He uses my name because his name is un-Google-able. So he sort of uses my name, which is good enough for me, I’m very happy with that. Steve: Okay, but his online persona does take on your last name, right? Steve: Well played Laura. So can you give us the quick background story, and tell us how you make a living online. Laura: Yes, so like you mentioned, my business LKR Social Media sells trainings to entrepreneurs about what I call ‘Creating Fame’ making yourself business famous using social media and online marketing. And it’s just something that I have built up, bootstrapped and slowly over time, moving from web design to social media consulting to now a totally scalable business. Steve: So what’s cool about this is, you started out as a web designer, and you really had to scrap for your clients, right. Laura: Yes, the story I always tell is, remembering standing in the snow in the street in Chicago. I used to live in Chicago where we have the most terrible winters, and I would have to wait for the bus to go meet with a client in person. To give them my proposal, and try to get them to sign up with me, and I was so broke I had to ride the bus, but I would try to wear my little heels and my little business outfits, which are not very snow storm friendly. So, it was not the most glamorous time of my life. Steve: So how did you turn it around, and actually get people to start coming to you? Laura: Well, I really saw that so much of what I was doing was starting from scratch. I think this is something a lot of business owners can identify with. I really had this big epiphany that no matter how hard I was working, every single client, every single prospect I was starting over. You know it didn’t matter how great a job I did convincing the last guy, I would meet someone new that I tried to pitch my services to, and I had to do the whole thing all over again. Which when you are selling a service can often take months and months, going through the proposal process, and trying to get them moving on the project if maybe they don’t care so much about getting it moving. And I really started thinking about how can I make this smarter and more leverage, and even though I was a web designer, and I was talking to my clients a lot about online marketing, I really wasn’t doing of it for myself because I think I had this mental block like, I am a local business, and people have to meet me in person before they buy from me because that is how it always operated. So I decided to quit doing web design and move to a new business model, and when I started doing social media, I really just drew a line in the sand like, ‘I’m not going to do this un-scalable marketing tactics, I’m going to find a better way. I started going to networking events for my clients. And networking events are actually really great when you are starting out, especially when you are starting your first business, because you can meet people that will give you advice, and help you, and meet clients and stuff. But I was sick of going to them, and they are not scaled at all, so I am like, I am going to do a newsletter, I am going to do a blog, I am going to do a social media marketing, things that don’t involve me going out there meeting with people one on one. Laura: Well, I go to conferences now, so I’m talking about more when I started out I would do things like, do you know there is an organization called B&I, and there is one called ‘Bids Club’, where you meet at 6 a.m. every week. Any ideas that you find, the leads for other people in the group, like I am talking about really painful. Steve: Right, yeah, that sounds very painful. Laura: Yeah, painful networking. I like going to conferences that are fun and learning things, I like doing that. Steve: Okay, so you are getting fed up trying to find clients. So let’s go back to the very beginning. So how did you start out building this business and making yourself well known? Laura: So I started– so when I started the social media business, I did have a few hundred e-mail addresses that I’d collected over the past two years running my web design business. And these were people I mean, I had met all of these, all 200 of these people in person at networking events around Chicago. And I think that’s an important little tidbit is you have to start wherever you are with whatever you have. A lot to people feel so frustrated especially with social media. It’s so frustrating tweeting when you have ten followers, you know even when you have a hundred followers, it’s really hard to get putting in the time and effort, feeling like no one is listening, but we all start with zero. We all start zero, then ten, then twenty, then a hundred, and you have to keep putting in the consistency that’s the only way that it can grow. So that’s what I did. Even though the people– the e-mail addresses I had, they had come to me for web design and not social media, I figured, you know what, close enough, they have businesses, they’ll probably be interested. So I started from there, I started a newsletter that was really high quality, and was at the time a little bit different than what a lot of people were doing with newsletters, and I asked them to spread the word and they did. People forwarded it around, people found it helpful, and that’s kind of how things started taking off. Steve:	So, was there any way that you kind of jump-started this list, or was it just totally slow and steady organic growth. Laura:It was really more of steady organic growth. I actually I was just looking up at my kind of growth tracks for my social media accounts. I was looking at it for like marketing for myself, so I can put this little chart on the page showing how I’ve grown over the years, and I was actually kind of surprised looking at my Twitter account. I got on twitter in 2008, and when you look at it as line graph from 2008 till now, it’s actually a really, really steady upward line. It’s not like one day I had this huge spike and then it took off from there, and I think that’s good news. I think it’s really reassuring me, you don’t have to have some huge lucky break, obviously that helps if it happens to you, but for me it’s been, I’m so huge on consistency. You know beyond social media everyday, I blog every week, put a newsletter out every week, I’ve done that for five years and it’s paid off. Steve: So you have your newsletter, so what did you– which social media avenue did you start using next? Laura: It was Twitter, and at that time actually Facebook pages didn’t even exist yet. And so I got, I jumped on that bandwagon as soon as they were added like back when they were fan pages, and you became a fan and then you turned them into ‘likes’. So Twitter was the big think for me starting out. I started using Twitter just for fun and then after that I was kind of using it to connect with local businesses in Chicago, and then Los Angeles when I moved to L.A. So I started gathering I’d talk about small business, so it started to sort of gathering a following of entrepreneurs and people who are interested in small business on Twitter. Steve: So you know, a lot of people actually are kind of confused by Twitter, so if you could just go into a little bit more depth in how you used Twitter to actually gather your following, that’ll be great. Laura: So a few of them are kind of like basic things you need to know about Twitter. One, with any social media tool, you need to spend a lot of time interacting if you want to grow a following. A lot of people make the mistake of sending out their status updates, especially now that there are all these tools that make it really easy. You check out something like buffer where you put up your updates, send it out to all your networks at once. Steve:	I don’t remember actually exactly when I found you, but yeah, it’s been a while for sure. Laura: Yeah and one of– I think I e-mailed you first. I think I just sent you ane-mail, and I was like, I like your website, I think that’s how we met. Steve:	I don’t know, maybe. I just remember exchanging guest posts at one point, but that was like many years ago actually. Laura: Yeah, so like I do that all the time with people that I like their blog, I like their business or I like what they are up to. I’ve always done that, and I still do that. I just send them an e-mail and I’m like, “Hey, I think you are cool, hi.” And you know it’s nothing, sometimes they don’t respond, sometimes it develops into a friendship where we keep in touch every so often and hopefully get to meet in person at some point, but that’s really the simplest way to think about social media and that’s surely how it works. Just start chatting to people that you find interesting or people who seem interested in you and what you are up to, and making friends is how your audience starts growing. Steve:	So you have this– let’s say you have this brand new Twitter account, and you have zero followers, how would I go about going and making friends when I have like no clue whatsoever? Laura: Yeah, so the most important thing first of is that you need to send people to your Twitter account. So some people are going to start following you within Twitter. And really the way that that happens, I mean the simplest way that it happens is the re-tweeting. When someone else re-tweets your tweet, your tweet goes to all of their followers. So re-tweets are just really cool, really powerful way to get in front of existing audiences. You know, someone can re-tweet you and they have 5000 followers, and those 5000 people have seen your tweet, awesome. So on Twitter it builds up organically within twitter but also you need to send people to your Twitter account from your other sites and social media channels. So if you are on Facebook, if you are on You Tube, if you are on Pinterest, you need to be continuously linking back to your Twitter account on your website, on your e-mails, you need to link back to your Twitter account. And it sounds really simple without actually a huge place where a lot of people kind of slip up is, they link to their Twitter account, they are like, “I am on Twitter”, and they have one link somewhere, but it is way to buried. People aren’t going to try that hard to find you on Twitter. You need to make it really obvious and really easy for them. Steve:	So here is something I want to ask you. You know Twitter– everyone has this gigantic Twitter streams like it is hard for me to keep up with a whole bunch of people and often times these updates just fly by. So, in terms of the different social media platforms, Twitter, Facebook, Pinterest, do you get a significant amount of traffic from Twitter, given the nature of the platform? Laura: I personally get the most from Facebook, and second most from Twitter, it was different a few years ago, it used to be more from Twitter than Facebook. But of course it is going to depend on where you spend your time and energy. But I’m glad you brought that up because that’s a really important thing to understand about social media, because people get really frustrated about that. Especially for us on Facebook, there has been so much uproar about this. Stuff like, Facebook isn’t showing my updates to my fans, and it is just getting less and less. Like I have just been watching my own Facebook page, it is crazy how much it’s dropping lately. They are showing your updates to so many fewer people than they used to. But that really shouldn’t be a big shock, because it’s just the nature of social media that people pop on and they see what they see, and then they leave. You know on Twitter, it’s not like people see all of your tweets either. People sign on to Twitter for ten minutes, if you happen to send out an update while they are there, they are going to see it, if you don’t they are not going to see it. And that is why you probably need to update more than you think you do, because you read all of your stuff, so this is something that’s always funny to me, like, you will always feel like you are promoting too much because you are like, I have talked about this podcast ten times over the last three days. Like I just keep relentlessly updating my social network sites. I’ve got my podcast, check out my podcast. But most of your followers you know, I read a stuff that, your Twitter follower will see on average ten percent of what you post to Twitter. That’s like a real active user, because they are not signed on at the right times. So to you it feels like you are being relentless, they might not even have heard of it once. So you need to post a lot more than you think you do, and post about the same things more than once. Steve:	Okay, so what you are basically trying to say is you don’t really have to be afraid that you are driving people away with the same updates over and over again because chances are that people are not even going to see a single one of your tweets. Steve:	Okay, so that’s interesting. So how do you strike the balance between being kind of social and then promoting your own stuff? Laura: You definitely have to do both, because no one’s really interested in following a Twitter account that’s just promos, unless they already have a really strong affinity for your brand. And we see that with big retailers, you know you sign for their Jay crew mailing list and they only send you promotions. There is no content in there for the most part, it’s coupons, it’s promotions, and if you are already a fan and you like their stuff, that works. So, people do want to hear you promoting, and actually, I would guess that a lot of listeners to this podcast, everyone is afraid to you promote too much, most of the people that tend to check out my stuff actually are not promoting nearly enough, they are way too afraid of being too pushy. But, if someone has chosen to follow you on social media, clearly they are interested in your business. That’s if you are there talking about your business, that’s why they are following you on social. So, I would say you don’t want to promote you know more than half of your updates, and even half of your updates being promotional will probably be a lot. But that’s also where the conversation comes in, the conversations that you are helping people back and forth probably isn’t going to be promotional. But to give you a number let’s say like 15% of your updates are going to be promotional. Steve: How many updates do you put out a day on Twitter, on average? Laura: This is something we are experimenting within my company; I know we’ve gone back and forth between doing like minimum three a day, and maximum six to eight a day. Steve: So, you are actually not twitting a whole lot, right? Laura: And then, I will also have replies to people, so those are the replies. Steve: Okay yeah, those are the social ones right, yeah. Okay so yeah, I think that’s how I have mine set up. I still have a full time job, and I don’t have time to be on Twitter all the time, so, I have actually resorted to automation tools. Do you recommend automation tools in general? Laura: Yes, it’s funny that you say, I have resorted to automation tools, because I know some people, oh no, you know don’t automate your social media. I think that’s such a bad advice for a business owner. I think it’s crazy to expect a business owner to have the time to check in on social media all day long. And there is just no reason for you to be there live at this random specific times, when there are tools like buffer, or like hootsuite that make it so easy to schedule an event. It’s still you writing it, you’re not– you don’t have to outsource the writing, it’s still going to sound natural, like you, it’s just you don’t have to be there sending, clicking send the moment you want it to go live. Steve: That’s great advice, I often feel guilty that some robot is tweeting out my stuff. So, okay let’s go back to your business sorry. So you started out– you started gradually building up your Twitter following, and what would you say you focused on more? The e-mail list, or Twitter in the beginning or? Laura: I’ve always focused on e-mail, which is probably a big secret to my success, I am definitely one of those people that’s a big believer in the e-mail list, and I had a newsletter for a few months before I even started with the blog, which now is very unusual. Then, it was sort of unusual too, but so I started with my e-mail newsletter, Twitter was really promoting the e-mail newsletter, and then I added on, Facebook, and blogging. Steve: Okay, so what about Google, how does search come into play here? Laura: Well search is sort of the foundation of it all I guess, I mean everything affects search, and Google has told us that social media will continue to affect search more and more. But even if Google didn’t consider what they call social signals, you know didn’t consider social media important in ranking your content, social media would still be incredibly important, because you are not going to share your content or get back links or anything like that, it’s going to be very hard to do that without social media. That’s how blog posts spread, you know that’s how most of us find blog posts to read, it’s something on our Twitter, our Facebook accounts. So it’s going to be very hard spreading your content out there so that anyone can link to it, and of course links help your search ranking, unless you are promoting it on social. Steve: Okay, so let’s rank the social media sites now, in terms of what you perceive to be effective. So there is Twitter, Facebook, Pinterest, and G plus. Laura: And maybe another one, Instagram, You Tube. Steve: Instagram, LinkedIn also, Yeah. Laura: How important are they in order? Steve: Well, okay, so let’s rephrase the question a little bit. Let’s say I’m a brand new e-commerce store let’ say, what advice would you give to someone who wants to get active in social media? Steve: Yes it is, yeah, yeah. Pinterest is actually– it’s not just traffic, it’s the conversions from Pinterest are much higher than the other platforms. And I am sure that’s what you probably would see with some of your e-commerce clients as well, just because a lot of times the picture is what sells the product. Laura: Well, and Pinterest is so cool because I mean, I knew that I have a board on Pinterest on wish lists, that’s literally a list of products that I want to buy, you know that doesn’t really happen on other social media sites, and people are looking for things to buy, and keeping boards of things to buy. Steve: Yeah, that’s totally true, and in fact I don’t get Pinterest. See if my wife is here interviewing you then she could chat with you about it, but my wife handles the Pinterest boards, and you know she has a ton of boards of stuff that she just likes, it’s addictive, I don’t get it, but for her it is very addictive. Laura: Yeah, I am a huge Pinterest fan, myself just for fun. And we use it for my business, but it is not a huge traffic source for us. For a business like mine that’s selling trainings, it’s much less visual, and we could get creative, and we can drive more traffic there, but we definitely drive a lot more from Facebook and Twitter. But if you are in a retail business where people might pen the things that you sell, I would say focus on Pinterest first, honestly, because like you said those are going to be high converting customers. And then for most businesses Facebook is the second biggest, and Facebook is going through a lot of changes right now, people are scared of building up a page on Facebook because the reach is declining. But I still think Facebook is very, very much worth the time of any entrepreneur, because Facebook has the mass that none of the other social networks have. Steve: I’ve noticed my reach has fallen dramatically, and do you actually pay money to sponsor your post, because right now I just haven’t done that because it just pisses me off that they want to make me pay to actually have my stuff go out to the fans that I spend a lot of time trying to get. Laura: Advertising on Facebook is a great idea, clicking sponsored you know boost this post, is an absolutely terrible idea. It’s like using Facebook advertising with none of the controls, none of the regular interface, none of the regular options on. It’s sort of bordering on sneaky, that they even put that in there, because it’s really crazy they are not giving any other targeting options. So, my company does spend money advertising on Facebook, we don’t boost posts in that way. Does that make sense? Steve: Okay, so for your advertising for your business, do you just buy a traditional feed Ad and do you just send it to a landing page? Is that how you use it? Laura: Yeah, we send people to landing pages to get their e-mail address, we usually use promoted posts because we found they convert better than a kind of side bar Ad, and they have some of the cool built-ins social stuff like people can see other people that are liking it, other people that are commenting, they can see if their friends like it. And people will share your Ads which is pretty amazing when you think about it, that you would pay to advertise something and people would just choose to share with their friends. Steve:	Yeah, I have started using that for our online store and my course, and it’s actually worked out really well. I think for me and you can confirm whether this has worked out for some of your clients, I found that promoting actual pieces of content with a sign up box works better than just sending them directly do some sort of product page. Laura: Yeah, we almost never will send paid Facebook traffic right to a product page or sales page. We always do some sort of funnel, whether it’s like sending to a related blog post, that’s kind of related to what they are selling, getting them to opt from there, or sending them to a landing page where they get a free piece of content if they opt in. Steve:	Okay, okay so it sounds like I’m at least doing something that’s similar to what you recommend, which is good. Okay, so let’s talk about your business model. I know it’s evolved over the years. So you sell various courses like creating– is ‘creating fame’ your flagship one? Laura: Yeah, Creating Fame, Social Brilliant, and Social Media Marketer. Steve: So, I know that you used to sell these behind these gigantic launches where you get a whole bunch of people to sign up, and then you close off the course. Are you still signing it that way? Laura: Yeah, we do a mix of both, so Creating Fame is sold that way, Social Brilliant and Social Media Marketer are available all year round. Steve:	okay and I remember at one point, not that long ago, you decided to do an ‘All in one monthly subscription’ is that also available? Laura: That’s for social media marketers, yeah. Steve: Okay, so can you just describe how all these different businesses models kind of mesh together? Laura: Yeah, I’m just kind of realizing, I’m really am hitting every angle, now that we are talking about it. So yeah, Creating Fame is a higher priced program, that’s a $2000 program, and we’ve played with different models. In 2014 we’re opening now just once this year, so we’ll have you know a big exciting open and close. And Social Brilliant is comparatively lower priced, that’s about $500, and that’s kind of smaller program that lays out a social media strategy for you, kind of how to, top to bottom, what to do every day on social, and that you can just go to my site and you can buy anytime. So that’s you know if you are not quite ready for Creating Fame maybe you’ll start with Social Brilliant. And then Social Media Marketer is a collection of a lot of different social media trainings we’ve done over the years, that gets more specific than Social Brilliant. So Social Brilliant is kind of like the foundation, and Social Media Marketer is a bunch of in-depth classes about building your lists and selling on social media and connecting with influencers and all sorts of different things, and that we sell for $95 a month to get access to the library of courses. Steve:	So in determining which business model to use, subscription versus lump sum versus gigantic launch and close. Can you just go through some of the decision making processes that were involved in deciding what to do for each? Laura: Yeah, I mean, I always say the model really it should depend on what best serves the content and the customer. So with Creating Fame, so that’s a longer program, that’s an eight week program, and because it is more in-depth, and we have groups that goes along with it, where you can ask questions and get advice. So with a program like that, it’s really ideal to have people going through in groups together. So you know that doesn’t mean it has to be only once a year, but it’s really nice to do some sort of open and close, so that people are like, okay, we are on week one, we are on week two, what is going on with you for week three. It’s just a bit easier to keep everyone together. Laura: So that works really well for that. And then Social Brilliant I mean that one does not have a group aspect, that one’s just training, you go through yourself, of course you can e-mail and ask us questions, but it doesn’t have a group that goes along with it, the way that it works with a program like Creating Fame does. And so that’s a good way for us to just have something available on our site all the time for people who are ready to dive in right now, and if they want help with their social media they can go there and then basically if they want more on-going help month to month they want to go in-depth and get more training they can do the subscription model. Steve: Okay, and that is the Social Brilliance, sorry I got it? Laura: Oh no, that means I inverted names. We are actually changing the name Social Media Marketer. Social Media Marketer is the subscription one, and Social Brilliant is the one-off. Steve:	Okay, and then the subscription one, so why was that one a subscription based? I’m just curious. Laura: We actually used to have everything as different courses that you could buy one-off, that’s inside Social Media Marketer and we found that it was causing a lot of customer confusion and strife because they were like, you are the social media expert, how do I know which class I need? You know, like you pick for me, you tell me what to do. And it was also from an internal perspective, just so you know of like, funnels, and opt-ins, and marketing sequences that we had was getting a little bit crazy, and a little bit convoluted, so we thought it would be easier for us, and easier for customers if we just put everything in one subscription. Steve:	Okay and everything is still downloadable, right? Steve: So, do you ever have people that just log on for a month, grab everything and then just go? Laura: Yeah, I don’t really worry about that, that’s just– I don’t want to punish customers who do want things to be downloadable, because I understand why. I often like to download materials instead of watching them online. So I don’t want to punish customers just because there are a few that will take everything, and also that’s how the model is. You know, you just can’t deny that that’s a part of it, that people are going to do that. Steve: Yeah I mean, for my course the reason– so what I do is, I kind of promote the live office hours that I give, and the human interaction that you get with me, so that even if you were just to download all the materials and leave you will be missing out on a huge portion of the class. Laura: Yeah, we have some features like that as well, but that hopefully you will find them compelling and they are going to keep you in month to month. Steve: Okay, so a good question for you that I often get is, you know what mistakes do you find that most businesses are actually making with their social media efforts, and if there is anything that you could suggest that would improve the average business that would be great. Laura: One of the biggest mistakes is not using scheduling and automation enough. This is something I have to plug the Social Brilliant course because it’s really in-depth on how to really treat your social media marketing like a piece of content that you need to create a content calendar for. Most people just do their social media super spritely one-off when they have something to say, they put something in, most of the time they can’t think of anything to say, so they don’t put anything in. And social media is a marketing channel that needs consistency like anything else. And like we talked about it needs frequency too. If you want anyone to see your updates you are going to need to update a good amount, and I don’t want to be scary, it is better to update once a day than not at all. So it’s better to do something than nothing, and you need to start with what you can do. But if you sit down and put in a bunch of social updates at once, it’s actually not difficult to update. If you update three times a day, five days a week, that’s 15 updates a week, that’s about 60 updates a month for like four weeks a month. You can sit down and write 60 updates, especially if you batch them into categories, which is what we teach you how to do in Social Brilliant. So that’s a huge thing, it sounds a bit complicated when you are getting it set up, but it actually allows you to sit down and get your social media done like once a month, have it handled in one go and then you can just pop in and chat with people. And I promise you’ll see much better results from social if you do that. Steve:	So is that true with Facebook as well, you plan all of your updates kind of long in advance and just have them go out? Laura: Yap, and you know you will put in live stuff too, so you can always add that on top of whatever you are doing. You know if you want to put a lot of updates about what you are doing, share photos from where you are, all that stuff is great, but you don’t want to have to rely on that, you don’t want to be like, oh men, I’m at the park with my kids, I better take a picture for my Facebook page, because I’ve got to update anything today, and I have to have something to come up with. You know, you want to have a nice foundation going out every day and then you can add in life stuff too. Steve:	That is really good advice, I have actually like I said remember when I said I resorted to automation tools, because I always felt guilty that I wasn’t posting things in real time versus what was happening to me at that exact moment. So it sounds like your method is so much more scalable. You get a piece of software you batch everything, and then you just let it go for the month correct, or a week or whatever? Laura: Yes, it is a lot more scalable, and it is also much easier if you wanted to delegate or outsource some of your social media, it makes it a lot easier to do so with this method, because you can have someone write a bunch of updates for you and then you can review them. So I know that it’s kind of scary, just like letting someone take over your social media accounts, and you do have to be really careful doing that, because that’s your business’s face to the world, you are doing customer service there when you are responding to people. So I would not recommend that you just hire like, a social media person and just say, ‘do my social media’ with no instruction or interaction. But if you have someone write sixty updates, you can go through them, you can tell them the ones you don’t like, you can make any little tweaks that you want, and then you can just load them up or have the person load them up. Steve:	So what piece of software do you use to do this? Steve:	Okay, okay. So you literally schedule like sixty it is, at the beginning of the month and you just let– actually you probably have someone else do it now, is that…? Laura: Yeah, I have someone at my company do it, and we generally do two weeks at a time. Steve:	Okay, that is very good advice. So, let’s talk about Facebook. So you mentioned that Facebook has now exceeded your Twitter, is that true even with the fact that they have kind of diminished the reach across Facebook fan pages? Laura: It’s true for now, I won’t be surprised if Twitter surpasses Facebook’s traffic, but yeah even with the diminished rates right now, I’m still getting more from Facebook. Steve:	So is your strategy for Facebook different than Twitter versus LinkedIn, versus Pinterest, and that sort of thing. Laura: It’s not deeply different, and I think you can always tweak for the different networks, the more time you really want to spend getting really optimized, but the truth is you really don’t really need to. I mean, I could probably attract more likes and more traffic from Facebook if I went in and had like a Facebook only strategy where we were doing let’s say a lot more images that people on Facebook tend to like. Obviously on Facebook you can do longer post that you can do on Twitter and those can perform quite well, but it is kind of a question of diminishing returns. You know if we were spending so many more hours a week on Facebook would we really get that much more traffic? Maybe at some point my company will do it as an experiment and see, because it might be true. But I think that’s kind of a good lesson because a lot of people just won’t update something entirely because they are so stressed about getting it perfect, about being on there all the time. You know this is why you want to use automation so that you can just get it done, and then over time as you grow your business, and maybe you can hire more people to help you, then you can go and look at the specific networks. You know, what can we be doing on LinkedIn or on Pinterest to really grow our reach even more? But start out just building the foundation there. Steve: Okay, so let’s talk a little bit about you know what I really like about your business is you have employees from– they live in all different parts of the world. So what is it like managing a virtual team and how does it all come together? Laura: I love it, I think it is really fun. I am in London right now and my team is across the US and one in South America. We actually recently just met up, we spent a week together in Portland, Oregon where we all hang out and worked together in person, which was really fun. And I got to meet three employees that I hadn’t met yet in person, that I’ve hired since we last met up. So, I love working from home, and I hire other people who love working from home which is not for everyone. Steve:	Yeah, see I’ve been actually torn between this, because if I was to quit my job, I would be just sitting at home alone in front of my computer and Skype I guess. So how many people are on your team now? Laura: We have me and six other people and some interns. Steve:	So how do you manage the communication with that, do you guys just all get together on a Google hangout or? Laura: We have a lot of different tools we use, if you go to my blog and you search for social media tools so we can link it in the podcast. Steve:	Yeah, I will link it in the show notes. Laura: Yeah, you will find everything, but we use Google hang extensively, we do a team meeting every Monday where everyone’s on video on Google hangouts. We also do a phone meeting Tuesday through Friday, that’s like a five to ten meeting where everyone just reports what they are working on that day. We use Google docs very heavily for everything and we use confluence as our kind of wiki. Steve:	Was it always this large, did you always have six people or was it just kind of gradual. Laura: No, it’s all bootstrapped, so it’s all super gradual. Steve:	okay, that is really cool. I mean, it’s really great to have seen your business grow over the years to the size it is now. So you are making like seven figures now from what I understand. Steve:	That is awesome. So, a couple of questions I always ask interviewers, do you have a particular business book that has greatly influenced the way you think about businesses? Laura: Yes, I love to read business books actually. We recently added that as a little feature to my newsletter, but now we have the book that I’m reading right now, because I read an embarrassing amount of business books, and I thought other people might like to see what I’m reading. Two that really standout in my mind; one of my favorites is ’Double Double’ by Cameron Herold. Cameron is someone who’s been a personal mentor to me, and he’s not that well known, and the book is not that well known, but that’s a shame, it really should be. And it has like just a lot of advice for a lot of different little things in business, everything from productivity and planning, organizing your time to public relations, and marketing, just a lot of really actionable advice. It’s called ‘Double Double’ because it’s like double your profits, and double your– something else, I don’t know, double your business. Steve:	I think of other things when I think of double double, but okay, go on. Laura: Maybe the book needed a better name maybe that is why not so many people have read it. But that is really a favorite, I’ve learned a lot from him. And I learned a lot from him about managing a team, because I had a huge paradigm shift, something that Cameron taught me is that company culture is not just for Google sized companies. You know I never used to relate to that concept, as someone who works from home, as someone who has a small team. I always thought oh company culture means, you know, having a ping pong table, and having a happy hour, and having sushi lunch brought in. And you know we can’t do those things since we are a virtual company. But my company has a very strong company culture, and even when you work for yourself and you have a few freelancers, you have a company culture too, and the more awesome that you are to work for, the more amazing the people are that you are going to be able to get to work for you. And that’s something I learned from that book. Steve:	I just noticed based on your passing Facebook post that it sounds like, it appears like you and your team have a great time, every time you guys get together, it just sounds like a really fun company to work for. Laura: It is, it is really fun, like we all really like each other, there is no drama, there is no gulling in anyone, there is no craziness, it is a really, really great environment. And a great environment like that is the most attractive thing that you can give to a quality employee. More attractive than a giant paycheck even, so if you can create that kind of environment you can get some really, really great people on your team. Steve:	That’s awesome Laura. Actually you know what there is one question I forgot to ask you. Since you are so heavily involved in e-mail marketing earlier on, I just thought I would ask you a little bit about how you kind of structure your e-mails to get engagement. Do you structure your e-mails because a lot of us don’t have a whole lot of time, do you structure e-mails such that you just link back to existing content that you’ve written, or do you write your newsletters from complete scratch with all brand new content? Laura: Our newsletters actually do have new content and unique content, but it’s very short content. And this is something I did different when I was first starting out. At the time and even now our newsletters were usually multiple long articles, if not just one really, really long article, and I knew that I never wrote those, and I never had time to read those. So I thought okay for my newsletter I will just do one really actionable tip every week, it has to be something that you can actually do in ten minutes or so. So that really contains the scope, because they are short to write, they are obviously not too complicated. If it is just one little thing that you can do really quickly, and my little secret source for a newsletter and making that content is that, well we have unique content for the newsletter. It has not been unique every week for the past five years. We have basically about a year and a half’s worth of tips and we just re-cycle them. Steve:	Very interesting, okay so in a way that’s almost kind of automated as well. Laura: Yeah, yeah so we put in like a little update about what I’m doing and where I’m travelling and stuff like that, but those are super quick and easy to write. Laura: Steve’s dropping a hint here watch out follow me on Twitter watch out for what I’m coming out with. Steve:	I just dropped a hint about Laura’s product that’s coming out. So, anyways Laura I don’t want to take too much of your time, we’ve already been talking for forty minutes. Where can people find you and feel free to talk about all the courses that you offer online, I will go ahead and link these up in the show notes, but it’ll be great to hear from you what’s the difference between all these courses that you offer are. Laura: We ended up talking about that a lot during the show actually so I won’t bore people with that again, but you can go to my website and you can check on my courses, and you can find me on Twitter as LKR, and face book LKR Social Media. Steve: Okay, it sounds good. Well thanks a lot for joining me on the show Laura. Laura: Thank you so much for having me, it was really fun. Steve:	Laura and I have known each other for quite a while now, and it’s always great to catch up. Her social media business has truly blown up since I’ve known her, and she is a total rock star in this department. Now one thing in particular that I got out of this episode is that I really need to be automating my social media efforts much more. Now I’m the type of person that doesn’t like to tweet or post that much, but after hearing Laura say that only 10% of your fans actually get any individual social media post, I have kind of had a change of heart. Now be sure to check out the show notes for this episode at mywifequitherjob.com/episode9. And don’t forget to sign up for my podcast contest where I’m giving away a lifetime membership to my profitable online store class and free consulting. For more information go to my mywifequitherjob.com/podcast-launch. Thanks for listening. Thanks for listening to the mywifequitherjob podcast, where we are giving the courage people need to start their own online business. For more information visit Steve’s blog at www.mywifequitherjob.com. I find it is very easy to waste tremendous amounts of time on social media -being unproductive. Much like watching too much television. Thanks for the podcast, very useful info. I have a question about the Facebook ads. Should I use a post as an ad, instead of just a picture and a description? Also, how do I make the ad be “native” so that it can be shared? Nice interview. Seems to have great knowledge of social media. I love your blog and information is always healthy… What is a great way to get traffice to your website?